A few years ago my wife purchased tickets for us to go see Andrew Bird in Seattle at The Showbox. I’d been a fan of Bird for several years, always impressed by his ability to forge songs from seemingly nothing more than few Line 6 DL4 Delays, a violin and some whistled melodies. I hadn’t done much research on the rest of his gear and since I was about to see him live, I didn’t bother getting online to figure it out. When the day of the show arrived I wasn’t surprised to see him surrounded by a multitude of instruments, including an impressively sized pedalboard, a hollow body electric guitar, his violin, two microphones and, of course, a xylophone. What I was surprised to see were two flower shaped cones that seemed to come out of the top of his amp. 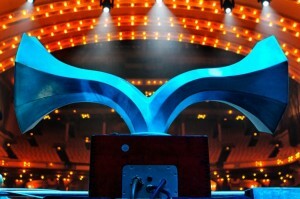 As the show progressed, this contraption began to spin from time to time – triggered with a foot switch in his lineup. The effect was more than enough to push his quirky, catchy tunes into the next realm, transforming regular songs into a cacophony of melody, art and chaos. I couldn’t help but identify Bird’s unique rotating speaker system with the Leslie Organ Speakers – those combination amplifier/loudspeaker units that also rotated. Although popular among many genres of music, those old Leslie’s are a rare site on stage, due to their size. But, many manufacturers have worked hard to put the Leslie back on the stage in the form of a stomp. In fact, back at the 2013 Winter NAMM, engineers at Hammond/Leslie announced their attempt to shrink the massive speakers down into a portable format that all could enjoy. The Leslie pedal is a bit wide at 7.5” by 4.5”, but it has a lot to offer. It has three switches for bypass, brake and slow-fast. The bypass stops the effect from routing and the brake causes the effect to decelerate to a complete stop allowing a multitude of fun effects. The slow-fast toggle controls the constant rate of spin between and excited whir and a more casual thrum. For knobs you get a rise and fall which allow you to fine tune the speed of the rotation. You get a distance knob that allows you to control how far the ‘mic’ is from the ‘cabinet.’ This allows you to modify the effect of where you are hearing the Leslie from. An overdrive knob lets you push the signal as if through a 40-watt tube and mix and level are the same as they are on any effects pedal. Only the reviews will tell how close Leslie/Hammond came to pulling this pedal off, but as the creators of the physical embodiment of the sound, something tells me they have a lot at stake and wouldn’t just toss out an effect that was anything short of amazing. 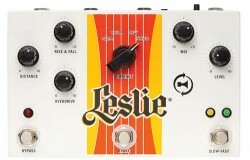 Check this pedal out and others like it at Pedal Finder. And don’t forget, if you have this pedal or get a chance to play it, come back and leave a review to let us know your thoughts!